Why is Drystack Storage Better? Keeping your boat in a drystack is better than traditional wet or ground storage because it offers quick, convenient access to the water, saves money and provides precious piece of mind. That is why The Drystack at Trafalgar Wharf is the best place to store your boat on the south coast. We’re so confident that you’ll love it here at The Drystack, that if after 30 days you are not absolutely convinced your boat is safer, cleaner, better looked after and better protected from the elements than ever before, and you are not totally convinced that our service is second to none, then not only will we give you your money back, but we will also deliver your boat to any Solent marina or drystack completely free of charge. Call Corinne today on 02392 706384 to book your boat in. 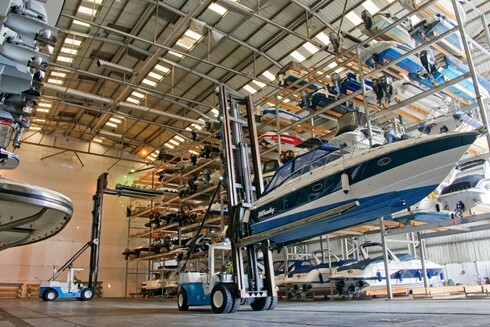 The maintenance costs for storing your boat at The Drystack at Trafalgar Wharf are a fraction of those you pay if you keep your boat in the water, on a hard standing or on a driveway. You will see a huge reduction in antifouling, lifting, cleaning and anode costs. Check out this costs table. As your boat is stored out of the water, your drives and outboard engines are less exposed to salt-water damage. And, as it’s undercover, your boat is also protected from ultraviolet light, rain, and the other elements. So, your boat is worth more for longer. If you store your boat at The Drystack at Trafalgar Wharf, it will perform better on the water. Your boat will be free of barnacles, weeds and anti-foul paint, which means a smoother ride for you and improved fuel economy. The Drystack at Trafalgar Wharf offers you incredible convenience, which means more time on the water with your family and friends. When you want to go out, just call us and we’ll have your boat waiting. When you come back in, simply tie it up and we’ll expertly store it, ready for next time. If you use The Drystack at Trafalgar Wharf, you won’t find yourself waist deep in water hauling your boat in and out of the sea. You can also say goodbye to long, back-breaking hours spent scraping, sanding and painting your boat. You’ll spend more time on board relaxing and enjoying yourself. By storing your boat at The Drystack at Trafalgar Wharf you’ll be helping to protect the local marine environment. Boats stored in a drystack accumulate less oily water in their bilges and don’t require toxic anti-foul paint. Hence, your boat is less polluting. 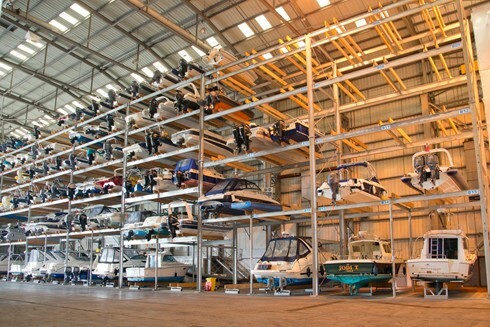 Store your boat at The Drystack at Trafalgar Wharf and you’ll be safe in the knowledge that when you’re not using it, your prized possession is locked up out of the water and undercover, and protected by 24-hour security. a day, 365 days of the year, whether you are out on the water or on the pontoon. The Drystack at Trafalgar Wharf is just five minutes from the M27 and opposite Port Solent, and with your boat waiting for you at the pontoon, you can be at the mouth of Portsmouth Harbour in less than 20 minutes. Want to know more about drystack storage and storing your boat at the Drystack at Trafalgar Wharf? Just contact us on 023 9270 6384 or info@thedrystack.com . 3 marine forklifts - Your boat launched GUARANTEED! We are the only drystack in the Solent to have 3 Wiggins marine forklifts, so we are guaranteed to always be able to launch your boat. The UK’s largest indoor drystack - We are undercover, weatherproof and secure. Valet fuelling - Don’t waste time queuing for fuel, we’ll fuel your boat for you before you arrive. Get on your boat and out on the water straight away. 5 minutes off the M27 with loads of FREE on-site parking - Get to your boat, park easily and safely and get out on the water quicker. Marina with sleeping on-board facilities - You can sleep on your boat the night before in our new boutique marina and make the most of your time afloat. 12 Months FREE Sea Start Cover for all annual customers - Peace of mind when you breakdown at sea or on the pontoon, help at hand 365 days of the year.